The Art Feature exhibition includes sculptures spanning four decades, all of which convey Edwards’ influence as an American modernist and conceptualist, as well as the artist’s deep-rooted expressions of social justice. This focused version of the gallery’s 2010 solo exhibition, which was widely praised (including Artforum’s “Best of 2010” issue), will be the artist’s first in Switzerland, and first solo exhibition in Europe since the early 1980s. Central to the presentation is Edwards’ celebrated series, Lynch Fragments, a selection of which was recently on view in the permanent collection galleries at the Museum of Modern Art, New York. The works from this series span three periods: the early 1960s, when he responded to racial violence in American history; in 1973, when his activism concerning the Vietnam War motivated him to return to the series; and from 1978 to the present, when he began making Lynch Fragments to honor individuals, and to explore memory and his interest in African culture. The most recent works display the remarkable range of expression Edwards achieves with his method of welding found objects into mask-like forms—including hammers, chains, and railroad spikes—and how, in the process, he renders violence, humor, and hope from these objects. The gallery presents approximately ten of these works from the 1960s to the present, as well as select pedestal-scaled works. Also included in the exhibition is the large-scale sculpture, August the Squared Fire (1965). This extraordinary work was included in Edwards’ first solo exhibition at the Santa Barbara Museum of Art in 1965, and his 1993 retrospective at the Neuberger Museum of Art. August was included in the Hammer Museum’s exhibition, Now Dig This! Art & Black Los Angeles 1960–1980, part of the Getty Foundation initiative, Pacific Standard Time, a series of exhibitions focusing on the artistic history of Southern California. Edwards was also featured in Crosscurrents in LA: Painting and Sculpture 1950–1970 at the Getty Museum, which will travel to Martin-Gropius Bau in Berlin. In addition to the Art Feature Sector, Alexander Gray Associates presents Melvin Edwards in Art Unlimited of Art Basel. 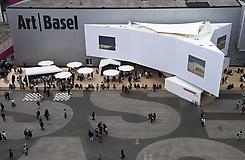 With its world-class museums, outdoor sculptures, theaters, concert halls, idyllic medieval old town and new buildings by leading architects, Basel ranks as a culture capital, and that cultural richness helps put the Art Basel week on the agenda for art lovers from all over the globe. During Art Basel, a fascinating atmosphere fills this traditional city, as the international art show is reinforced with exhibitions and events all over the region. Located on the banks of the Rhine, at the border between Switzerland, France and Germany, Basel is easily navigated by foot and trams.